EB 2.0 Kit. Yeah, it all fit in my jersey pocket. I was ready, my body was ready, I had water (unlike the Long Sock Classic), I had a pump (also unlike the LSC), I was on time (unlike EVERY race), I had my kit and my helmet and my gloves, and my everything else. My legs were ready, my heart was ready, my bike was ready, my seatpost bolt…not so much. Funny things, seatpost bolts. They have one job–except when you don’t tighten them. Yup, Team Colin didn’t tighten his seatpost bolt. Ding ding ding ding. We have a winner. So, by the time we hit the first bit of deep muck, you know, about 200m into the race, my knees were hitting my ears and I completely stalled. I looked like a clown riding a tricycle in a hurricane. I stopped, unclipped, raised my seat, and tightened the bolt with precisely 5Nm of torque. Boy, I REALLY raised my seat. MY FEET COULDN’T REACH MY DAMN PEDALS. I was pedaling like a newborn giraffe walking for the first time. Aw, c’mon. The race had barely started and I was already tanking. I stopped, unclipped, lowered my seat to the notch that indicates the correct height (that I ignored a minute earlier), applied 5Nm of torque, and I was off. But I was off and riding. Until the first rutted and rocky descent. Near the bottom of the hill, I catapulted over my bars and planted my face in the brush. Planted? No, I shoved my face into the bush. If it was a wrestling match, I would have lost because I was completely pinned by my bike and my own body! My back hurt, and my ego was hurter. The wet scrub painted my glasses with droplets of water, bits of grass, pieces of twig, a splash or two of mud, and daub of idiocy. And I painted the air with a giant blue streak of Team Colin approved, race-ready cuss words. 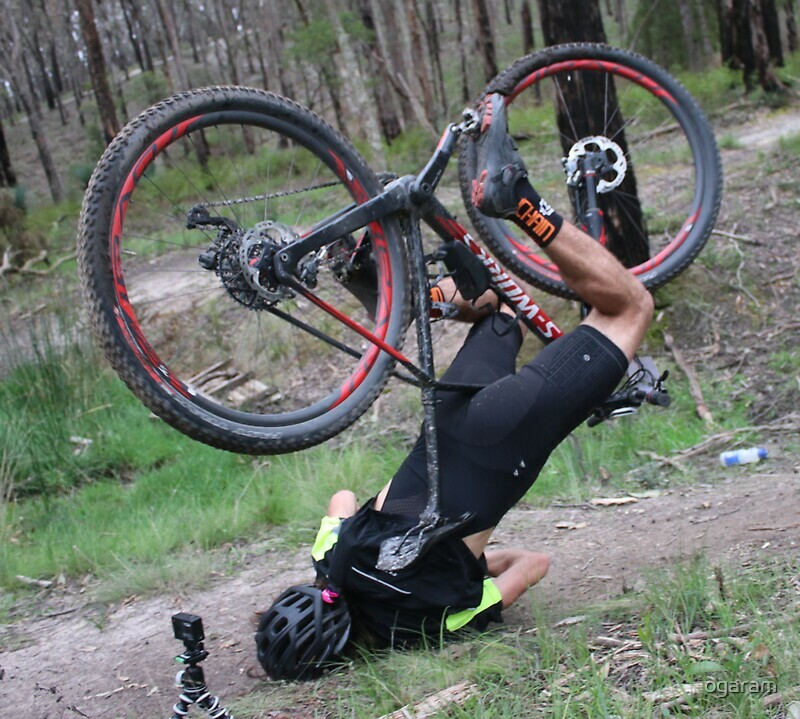 Later in the day, a friend who also crashed said “When I fell, I thought to myself ‘At least I didn’t go down as hard as that guy at the start’…”. Um, yeah, that was me. Like I said, it was not an auspicious start. But it was a Saturday, there was a race, I had 106.8k to go, I was on a bike, and my back would probably right itself. The day got better. Like, a lot better. Of course it got better. How could it NOT get better. First, it really couldn’t get much worse. Also, see preceding paragraph. To cut to the end of the race, I rode with a new friend, I made a newer friend, and I finished with a lousy time. However, while my overall FINISH time was bad, my overall RIDING time was awesome. Back to the start of the race. Here’s a cool EB 2.0 video from the folks at The Cycling Gym. EB 2.0 Start. Hey look, it’s Raf in the lower right corner. But his offer was sincere, and he’s always ready to help me. Plus, he took a minute to fish it out of his bag only minutes before the race started. At the START line, I met a bunch of friends, which is always cool, and did a line of MTB hugs. Jenn and Mike arrived with Fatboy Nation. Raf was there too (on a tank), Scott and Shannon were there, and familiar faces popped up were everywhere. Take a look at Raf’s Relive video. Awesome. My El Bandito friend, Simon, and I decided to start and ride together. Little did he know that a minute after starting, he’d be waiting for me to tighten my seatpost bolt, loosen my seatpost bolt, and tighten my seatpost bolt again. Or that he’d be waiting again for me to find my cool (and my pride) after a half gainer over my bars a few minutes after that. At least I wasn’t “that guy who did a face plant…”. Oh wait, I was. The course was anything but smooth. So, to recap in a slightly more succinct list. Whatever the opposite of auspicious is, that’s what the the first 2k of the race was. And I didn’ t stop smiling for a second. The course was perfect: Climby, rough, long, and challenging. What more could I ask for? Mishaps happen, and things get forgetted, but a great ride is a great ride. It wasn’t long before Simon and I were chatting like lifelong buddies, and I was looking forward to a great day on a bike. At 10k, we hit the first big climb, the Murderhorn, and tried to conquer it, but eventually gave up (totally near the top…) and walked. That’s when the race (and I) experienced a subtle, but kinda giant shift (see what I did there…because we were on bikes…shifting gears…). We passed a rider who was limping, and a little trail dirty from a spill. She stubbed her knee (Stubbing a knee isn’t a real thing unless you have fallen off your bike and actually stubbed your knee. Then it’s a real thing and it really hurts). I asked if she was okay, and checked to see if she needed anything. She seemed a bit rattled (yeah, I knew that feeling…), so Simon and I walked with her for a while. She wondered whether she was injured or just hurt. She was walking, so I figured she was just hurt. I’m not a doctor, but I’m a dad, and my Injury Sense is acute. By the way, when my son broke his arm two years ago, we didn’t realize immediately and he went to two birthday parties the next day (one of which was his birthday at the Indoor Bike Park, Joyride 150). We didn’t take him to the emergency until the next next day, so my Injury Sense is actually non existent, but our hurt friend didn’t have to know that, and I encouraged her to ride. She was signed up for the 100k, but contemplating bowing down to the 50k. I may not be a good doctor (or an actual doctor–whatever, shades of grey) and I didn’t know if her knee had other plans, but I knew this: You NEVER fail when you try. So at the next aid station I encouraged her to keep going. Here’s where the subtle change really shifted (shifting–I did it again–oh, never mind…). The thing about Team Colin is that it’s not just me. I’ve always said Team Colin is the people who support and nurture me, but it’s actually more than that. Much much more. Before I continue, I have to acknowledge that I am FULLY aware my blog is just a little speck in a huge universe of cycling, and it’s really not at all important, but it’s important to me (and I’m learning that it’s important to a (very) few other people too). Team Colin is about the vibe, and it’s awesome. No kidding, at every race, whenever I talk bikes, and each time I go to my bike shop, I am surprised by the people who talk about Team Colin. Some of them are riding titans, some of them aren’t, but they’re awesomely boss, and they get IT. They get ME. And that positive vibe is as much a part of me as it is a reflection of me. As the VOICE matures and evolves, I understand more about who and what I want to be in cycling. It’s the Team Colin VOICE. I know it sounds hokey, but I’m okay with hokey. I’m a dad and I also love Dad jokes! The Team Colin VOICE is positive, fun, and always full of awesomeness. Team Colin is part of a giant, loving, community. Team Colin NEVER passes a rider who could use a helping hand or word of encouragement. A race is a race, and we all know (sort of) what we’re signing up for, but dropping a rider isn’t my thing, and it’s not Team Colin’s thing either. Simon and I didn’t help a hurt rider (Pretty sure she was only hurt. Yep, pretty sure…), we just rode with someone who needed an extra set of wheels for a minute, in order to see the end of a race. It wasn’t even a conscious decision. We hit the 26k aid station and gorged ourselves with bacon (or was that just me doing all the gorging), and then we rode a bit more. We hit the 44k aid station, stopped to catch our breath, and then rode a bit more. We talked and rode. A 100k race isn’t tough for the entire time, but the last 20k or so can really wear on you, so at the 50k point, when I knew the race was about to get looooong, we made the decision to stick together. And so, the three of us rode together for a while, and combined, for a few hours, we were the Team Colin pack. Simon, me, and Jay Quallen. We fell into a comfortable pattern of chatting, silence, and chatting (and peeing–uncharacteristically, the EB 2.0 was a three pee race for me–boy, I really conquered that electrolyte situation…). Simon is seriously interesting, and has a story for everything, I like to ride in the lead, and Jay Quallen’s knee stub was a becoming a distant memory. Team Colin for a day! I’ve got two things to say about this picture. First, how did Simon’s shoes stay so clean. Second, Jacqueline looked way taller on a bike. It turns out Jay Quallen is an actual celebrity. Well, if you dig Canadian Business news. Jay is CBC News Journalist, Jacqueline Hansen. Sorry to out you, Jay Quallen (and thank you Kay & Peele for helping me pronounce your name correctly), but it was kinda cool riding with a TV lady. Plus, you’re really interesting (and way smart). And even though my early bike gymnastics had torqued my back to a billion Nm, and I had a bruised thigh and sore ankle, my Injury Sense told me to just ride. I willed the pain to take a rain cheque, and it did. I’ve been saying “Ouchie” for the last two days but it only hurts when I move or remain still. Last year, I rode almost the entire race alone, and found a bit of zen somewhere in the middle, when the heavens were crashing down, the beginning was as far as the end, and my body and bike melded together. It was life changing. This year, the Eager Beaver 2.0, while exactly the same course as last year (with a bit of rain too) lived up to it’s 2.0 indicator. The race was the same, but different, and so was I. The race wasn’t epic on a grand scale, and I didn’t GRADUATE (to my first 100k, like I did last year), but it was epic to a smaller degree and I graduated to something else. I graduated to a realization that Team Colin is a reflection of, and contributor to, a vast and awesome cycling vibe. And I gotta say, I really dig it. My finish time was just over 6 hours–an hour longer than I anticipated, and I know I could have easily achieved–but it was 6 hours on a bike, and it was 6 hours of awesome. Simon and me crossing the finish line a second time for a buddy pic. Sometimes the BOOM is epic, and sometimes it’s tiny. Epic photobomb by Stacy of Substance Projects. She’s awesome. And I even learned a bit about bike diving. Thanks to Dan Marshall and Substance Projects, the army of volunteers and staff, the bevy of awesome sponsors, and Team Van Go. PS. Can I talk about the 26k Aid Station for a second. First, bacon. That should be enough, but there’s more. It was staffed by Johnny and Emily from Team Van Go. I love these people. They are the epitome of riding cool, and awesomeness, and community, and bigger awesomeness. Aside from just being so nice, they’re epically nice. Also, Johnny actually has a “bacon pose”. Yeah, a bacon pose. And bacon. I ate a LOT of bacon. I seared my aesophogus becasue I get a bit impatient when some of it was still sizzling in the pan, but it was totally worth it and I’ll be able to talk again soon. Thanks Team Van Go! Please keep being you. By the way, I don’t want to write looooong blogs (this one is 2,500 words+), but they keep happening. Thanks for reading this far. As always, if you have something to say about this race, my blog, or riding in general, comment in the margin, or send an email to: teamcolinblog@yahoo.com. Comments on the blog are public, email is private. All photos courtesy of Norma MacLellan, Simon Bourassa, me, and someone using Jacqueline’s phone. Can’t wait for your next blog with a bacon pose!